Is the Trade Deficit a Drag on Growth? Donald Trump has made reducing the trade deficit one of his economic goals. And two of his top administration picks, Peter Navarro, who is slated to lead a new White House office on trade, and Secretary of Commerce nominee Wilbur Ross, have publicly stated that reducing the "trade deficit drag" would increase economic growth. But the Navarro and Ross statement reflects a deep misunderstanding of basic economics. Having a trade deficit—which happens when a country imports more than it exports—does not make an economy grow more slowly. It is true that when a country's Gross Domestic Product (GDP) is calculated, a trade deficit counts as a negative. But this is a matter of accounting. By definition, GDP measures the value of the goods and services produced within a country's borders. To tally GDP we take the sum of what households consume, investment by firms and government spending and account for trade by adding what is produced in the nation but consumed abroad (exports) and deducting the value of imports. The (faulty) idea of a “trade deficit drag” comes from this accounting identity – if the difference between exports and imports is large, then a larger number is subtracted from what households, firms and the government consume and the resulting GDP number must be smaller as well. But this does not mean that a trade deficit causes GDP to be smaller. The flaw in this logic is that both the trade deficit and GDP are outcomes of other, underlying factors. For this reason, there is no simple, straightforward link between the size of the trade deficit and the level of overall economic activity as measured by GDP. Consider a case where the United States has a spurt of growth due to, say, an increase in infrastructure spending. This spending will raise incomes and, therefore, consumption – including consumption of imported goods. This would be a situation where faster growth is associated with an increase in the trade deficit. Alternatively, the trade deficit could very well decline when there is a recession that reduces consumption of all goods, including imports. Not only is the idea that trade deficits cause slow growth wrong in theory, it is also wrong in practice. 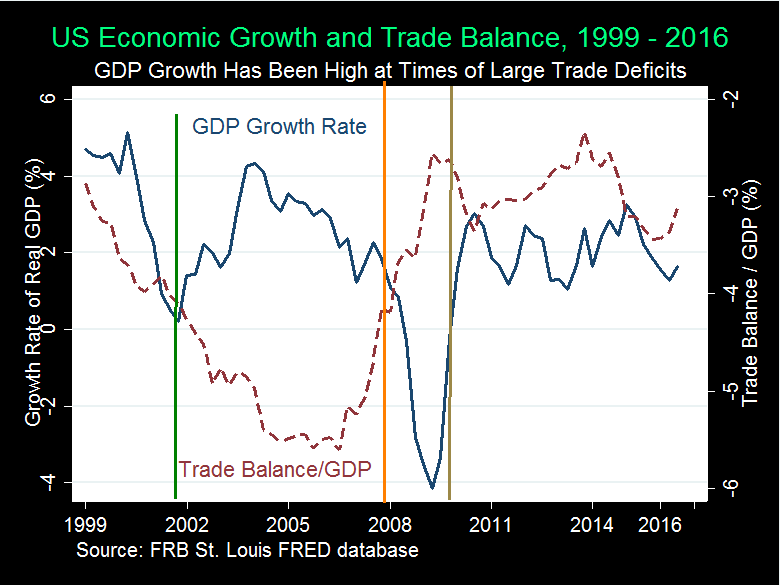 While the U.S. economy experienced strong growth between 2002 and 2005, the trade deficit went further in the red: from a little over -4% of GDP to close to -6% of GDP (see chart). In contrast the trade deficit shrank sharply during the darkest days of the Great Recession from 2008 to 2009 (the period between the orange and brown lines). Both trade deficits and overall growth are outcomes arising from other, underlying causes. In fact, over the past two decades we have seen the opposite of a "trade deficit drag": larger trade deficits have occurred when the economy has been growing more rapidly, and smaller trade deficits when the economy was performing poorly. Efforts to reduce the trade deficit by taxing imports would have broader economic consequences such as making consumers who have to pay higher prices worse off, and would also hurt companies that depend upon imported inputs. Other parts of the Trump economic agenda geared to boost growth, such as tax cuts and increased private sector investment are likely to worsen the trade deficit, setting up a potential conflict among competing goals. Is China a Non-Market Economy, and Why Does It Matter?